Lockheed F-117 Nighthawk სტელსის სისტემის მოიერიშე თვითმფრინავია, რომელსაც აშშ-ის სამხედრო-საჰაერო ძალები იყენებდა. F-117A-ს პირველი გაფრენა შედგა 1981 წელს, ხოლო 1983 წლის ოქტომბერში მიაღწია საწყისი ოპერაციული პოტენციალის სტატუსს F-117A აღიარებული იქნა და მთელმა მსოფლიომ იხილა იგი 1988 წლის ნოემბერში. 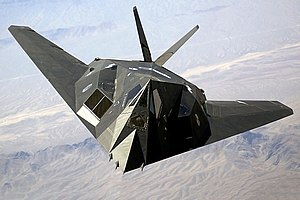 F-117 Nighthawk, როგორც Skunk Works-ის პროდუქტი, რომელიც განვითარდა Have Blue ტექნოლოგიების დემოსტრატორიდან, გახდა სტელსის ტექნოლოგიით აგებული პირველი მოქმედი თვითმფრინავი. F-117A ფართო მასებისთვის ცნობილი გახდა სპარსეთის ყურის ომის დროს 1991 წელს. აშშ-ის საჰაერო ძალებმა F-117 შეიარაღებიდან მოხსნა 2008 წლის 22 აპრილს, ძირითადად F-22 Raptor-ის მიღების, ხოლო მომავალში F-35 Lightning II-ის მიღების გეგმების გამო. ↑ 1.0 1.1 Lockheed F-117A Nighthawk fact sheet. National Museum of the US Air Force. წაკითხვის თარიღი: 21 მაისი, 2010. ↑ 2.0 2.1 Pae, Peter. Stealth fighters fly off the radar. Los Angeles Times, 23 აპრილი, 2008. წაკითხვის თარიღი: 27 აპრილი, 2008. ↑ Aronstein and Piccirillo 1997, გვ. 267. ↑ ჯიმ კანინგჰემი. Cracks in the Black Dike, Secrecy, the Media and the F-117A. Air & Space Power Journal, Fall 1991. წაკითხვის თარიღი: 19 მარტი, 2008. ↑ F-117: A long, storied history that is about to end. Air Force Print News, 28 ოქტომბერი, 2006. ↑ ქრისტოფერ შეა. Now you see it... Boston Globe, 4 თებერვალი, 2007. წაკითხვის თარიღი: 11 მარტი, 2009.
ეს გვერდი ბოლოს დარედაქტირდა: 18:03, 7 ივნისი 2017.